In short, with the help of this button we can access certain information from PayPal regarding the PayPal account you registered with us. But don’t worry, this doesn’t include any sensitive account information. It’s only about determining whether your PayPal account is verified. This information is so important to us, because payments to un-verified PayPal accounts are often declined by PayPal, which leads to additional effort on our part, and frustration, late payments and even costs for you. Unlike mass payments, we can’t assume the transaction fees for you on individual payments, so when that is the case, the fees are deducted from your payment amount. So it is in your own interest to verify your PayPal account and let us know. To prevent these failed transactions, beginning December 1, 2017 we will only make PayPal payments to verified accounts. This also includes all user accounts that have up to now received successful payments from us via PayPal. Therefore everyone has to run the verification once. And that’s exactly why we now have this button. Some important information up front: What you are not able to do with this button is actually verify your PayPal account. You are merely giving us the information about whether your account is already verified or not. You have to first perform the verification yourself in your PayPal settings. HERE you will find the official instructions for how to check whether your account is already verified, and if not, how to perform the verification. The validate button appears as soon as you have provided us a PayPal account and your tax information. When you click the button, a PayPal log-in window opens. You can tell that you are really on the PayPal website by looking at the URL, which begins with “https://www.paypal.com”. You approve here with a click on “Agree” that PayPal is allowed to inform us whether your account is verified or not. After just a few seconds the review is finished, and you will be taken back to the clickworker payment details page. The validate button is now gone, and under “account validated” it says “yes.” At that’s it. Now nothing more stands in the way of receiving regular payments via PayPal. Dieser Artikel wurde am 16.November 2017 von Daniel Marz geschrieben. Can I leave the tax details blank because I am from the Philippines, or what should I do to fix this issue? Well, I guess for those who don’t own a credit card are done for. I am trying to verify my account but not real sure how to. Please advise. Thank you. How do I verify my paypal account? It’s not coming up on my account like your instructions state. Hi my name is Jeffrey Dorsey i don’t seem to have thie Paypal verify button when i click on payment details. I cannot access to my account as click worker. please help. Hi, please send an email to help@clickworker.com, including your clickworker login. We will then be able to check your account and find out why you cannot log in. Hi Jeffrey, that would be either because you already verified your account or because you have not yet submitted a W9 tax form to us. This could either be because you already verified it before or because you first need to submit a W9 tax form before the verification option becomes available in your account. If you are unsure what to do, please get in touch with us via help@clickworker.com and include a screenshot of your current view under “payment details”. Tax details can remain blank if you are neither a freelancer or self employed. In this case, select “no” and save your settings like this. To confirm your PayPal data, please log into your clickworker account, access your “payment details” and click on the orange button. 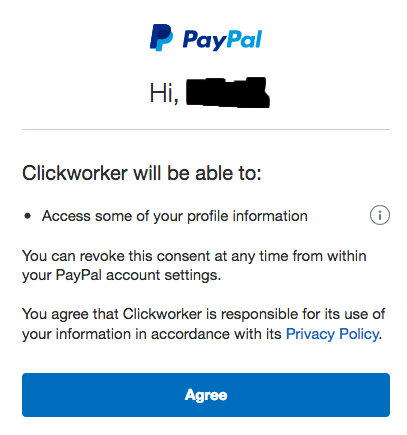 I tried to allow Clickworker on Paypal but my “Account data confirmed” is still “NO”. Please make sure that your PayPal account is actually verified and not just basic before running the confirmation.